Addicted to multi-tasking? Here's the ultimate for musicians, and it predates mobile phones by centuries! I've been fascinated by one man bands since I was a kid. I recently re-watched the Pixar short animation featuring dueling one man bands. Coincidentally, at around the same time, I came across a couple of good one man band images, so I decided a brief article on the subject might be fun. A one man band in its most basic form, of course, consists simply of a musician playing more than one instrument at a time. In this sense, the practice has probably been around since people started making music. 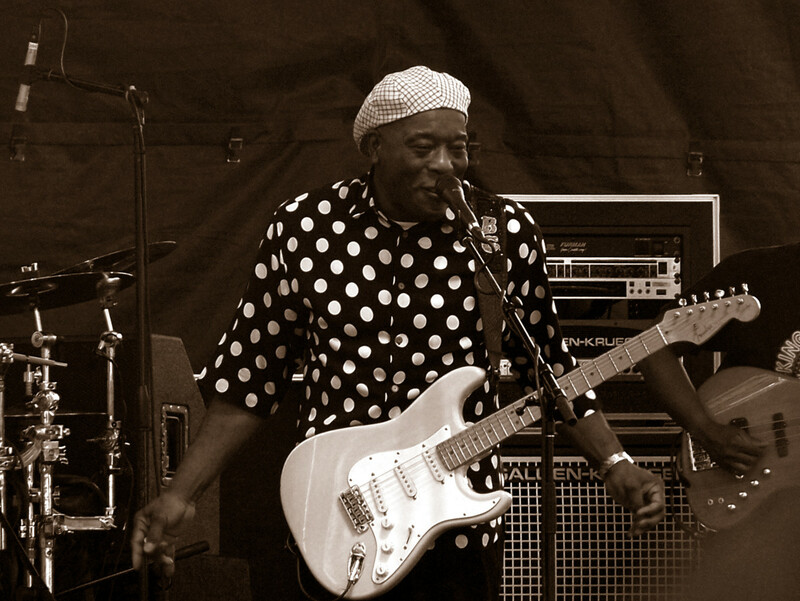 One man bands are often "buskers," or street musicians, although some certainly perform in more formal settings. The one man band idea is also used as a non-musical idiom in common speech to indicate people who do everything themselves. The pipe and tabor tradition, a basic early example of a musician playing multiple instruments simultaneously, is quite old, dating back to at least the Middle Ages. 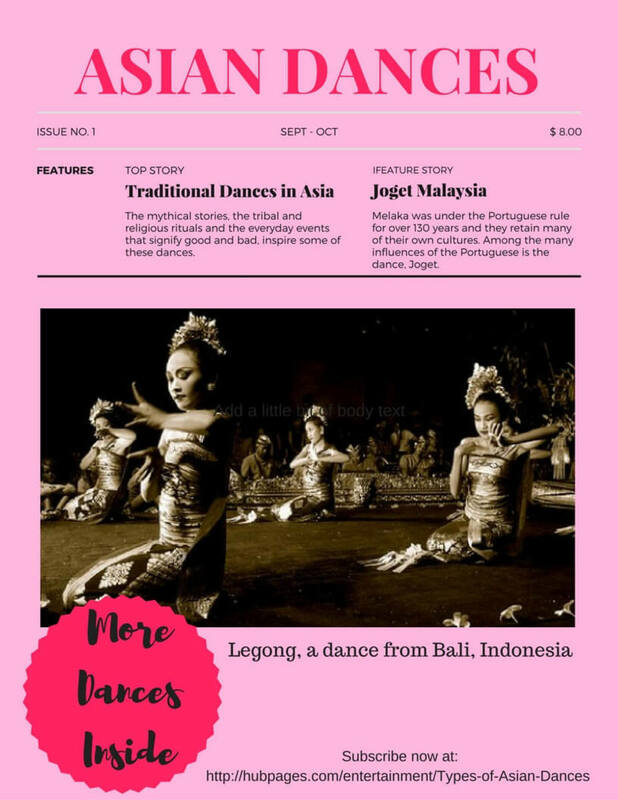 It involves a simple configuration in which a musician plays both a three-hole pipe and a drum, often to provide music for dancing. Two images below illustrate early pipe and tabor players. The first, depicting medieval players, is from the 13th century manuscript, Cantigas de Santa Maria. The second image is a detail from Andrea Mantegna's painting, The Triumph of Scipio, circa 1500, depicting a Renaissance pipe and taborer. 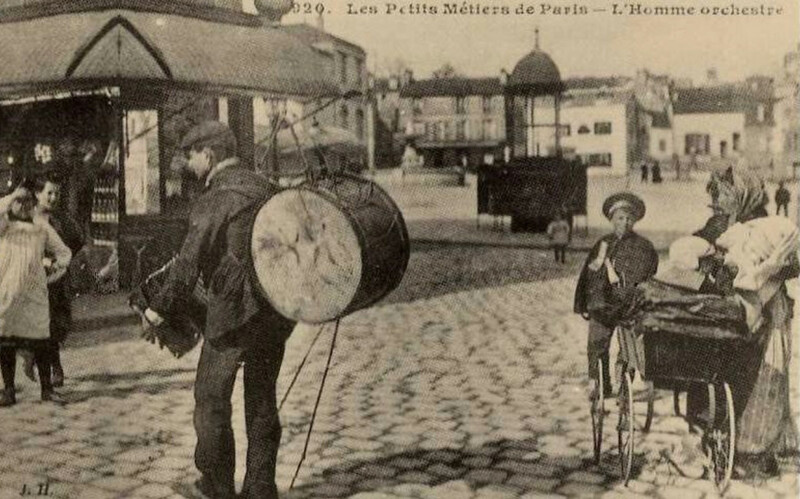 The following video clip shows a pipe and taborer demonstrating this early "multi-tasking" performance style, strolling around while performing. The tabor is suspended from his hand in this case, rather than from the more customary strap around the shoulder or neck. Is the next image (below) a one man band? Not likely. 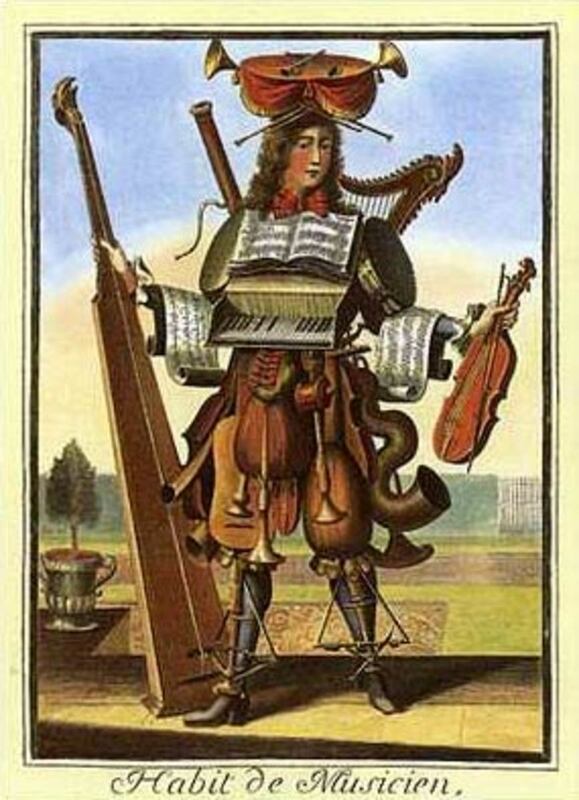 The picture is from Les costumes grotesques et les métiers, a series of fanciful trade costumes by French engraver Nicolas de Larmessin from the late 17th century. 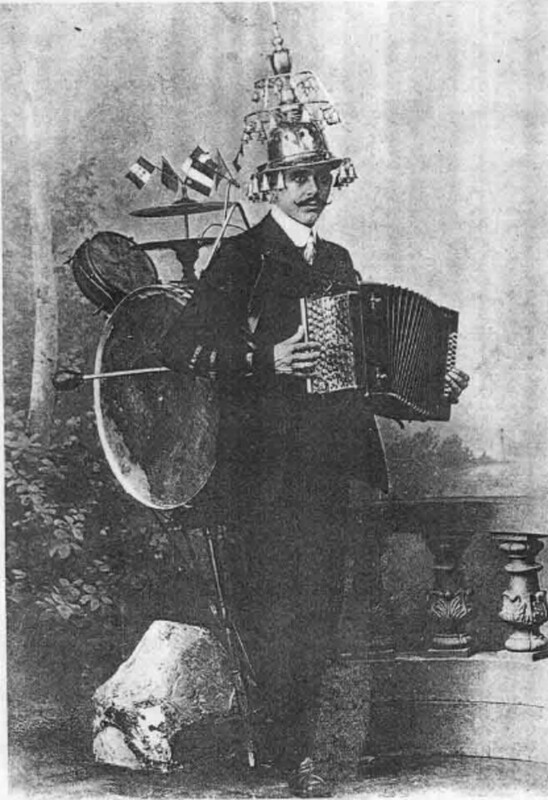 An entertaining image that is fairly common, it does bear a certain resemblance to one man bands, with instruments covering nearly every square inch of the man's costume. 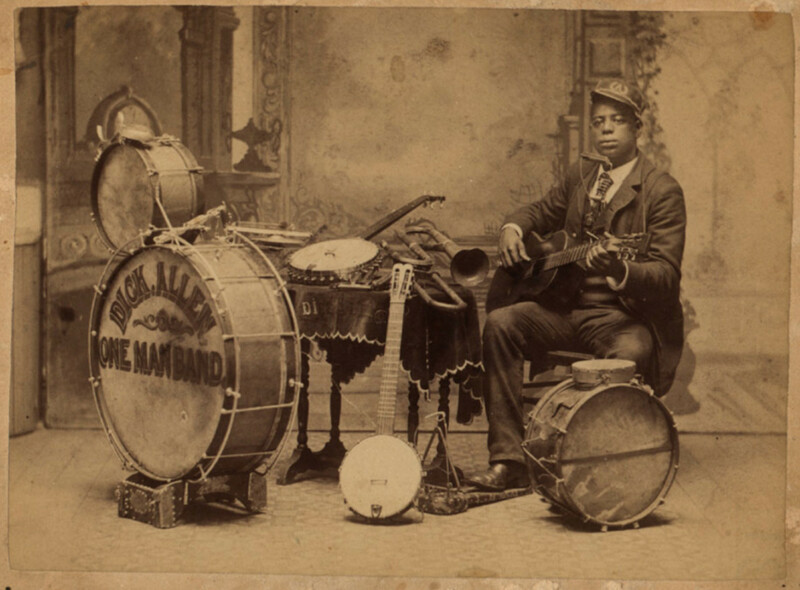 The instrument in the man's right hand is a string instrument called a tromba marina, and the squiggly instrument on the opposite side is a serpent, the bass member of the cornett family considered a predecessor to the tuba. 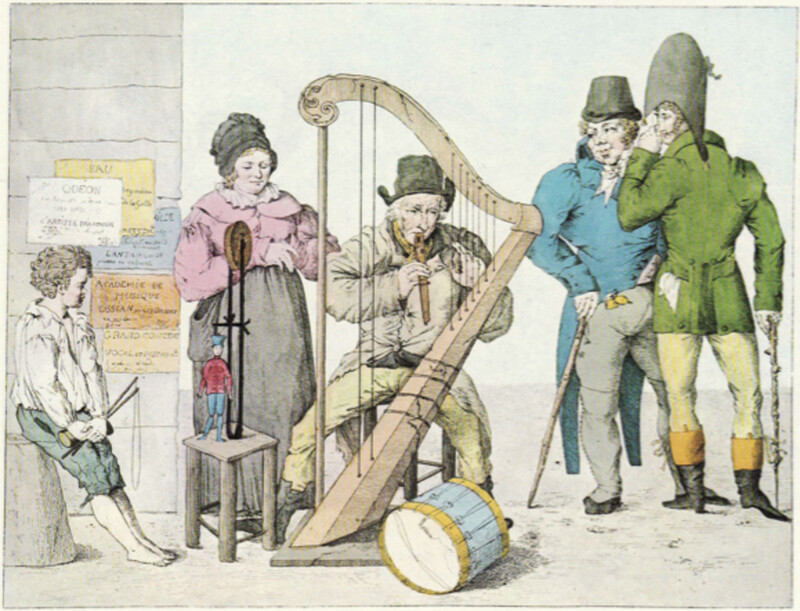 The below image, Ossian et Malvina, ou les musiciens ambulants ("Ossian and Malvina, or traveling musicians"), circa 1804, shows a pitiful-looking man playing a pipe, drum, and dilapidated harp (Fromrich, Musique et caricature, pl. 1). It doesn't look like what would normally be called a one man band, but the concept of a street musician playing multiple instruments is clearly there. Gradually, we start to see some of the elements that seem to become common in later bands. 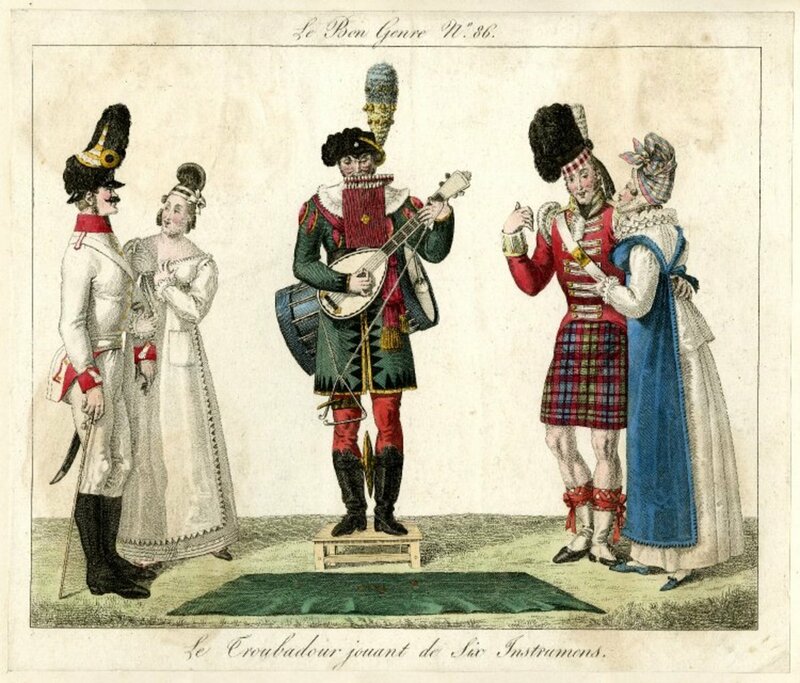 In the example below, a French lithograph circa 1820 portrays a man with two of the one man band's instruments attached to his person: a tree of bells derived from the Turkish crescent or chapeau chinois attached to his hat, and pipes just below his mouth. The other instruments—cello, bass drum, and cymbals—are freestanding. One unusual element not seen in most other pictures is the music that the player appears to be reading from, draped over the drum (see also the 1883 caricature, below, where the player reads from a lyre). The picture is from a set of lithographs entitled Tableau des vicissitudes de la fortune (Fromrich, Musique et caricature, pl. 59). 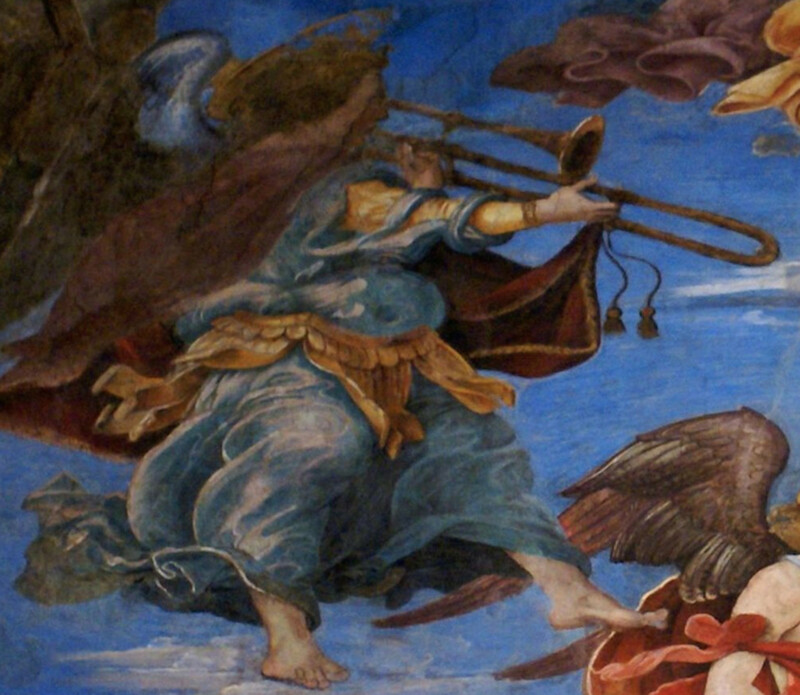 As the tradition developed, musicians began adding more instruments, solidifying which instruments tended to be used, and attaching them to their person to make the band portable. In the image below, Le troubadour jouant de six instrumens ("The Troubadour Playing Six Instruments"), an etching by G.J. 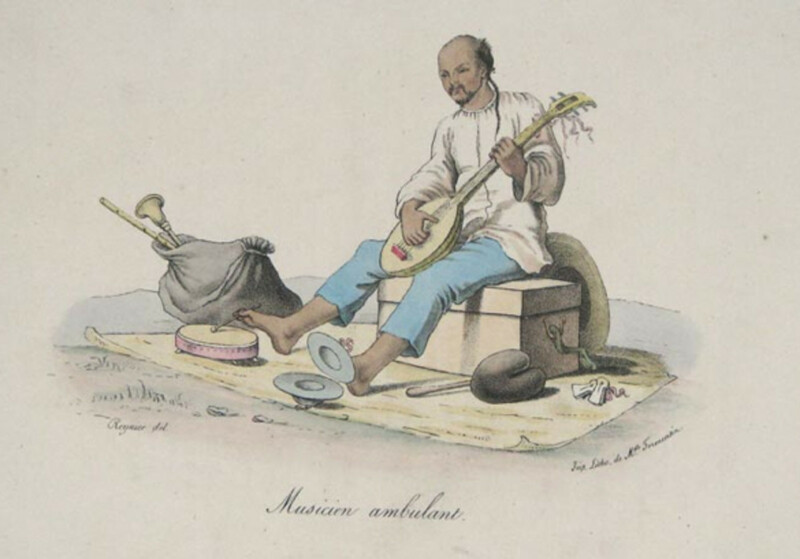 Gatine from a series called Le Bon Genre, c. 1815, the musician has quite a few instruments to handle. 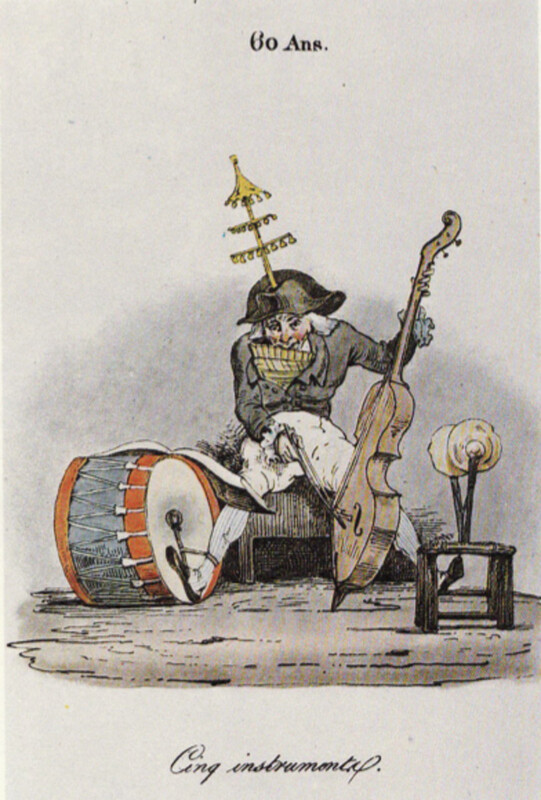 The large drum strapped to the back, pipes below the mouth, cymbals strapped to the legs, and bells on or above the head all become common in later one man band configurations (Fromrich, Musique et caricature, pl. 6). Another G.J. Gatine etching, Le grimacier Italien, from the same series as the picture above, shows a very similar one man band, this one apparently Italian (see below). It includes the common 19th century elements of bells above the head, bass drum on the back, pipes below the mouth, and cymbals on the legs (Fromrich, Musique et caricature, pl. 5). 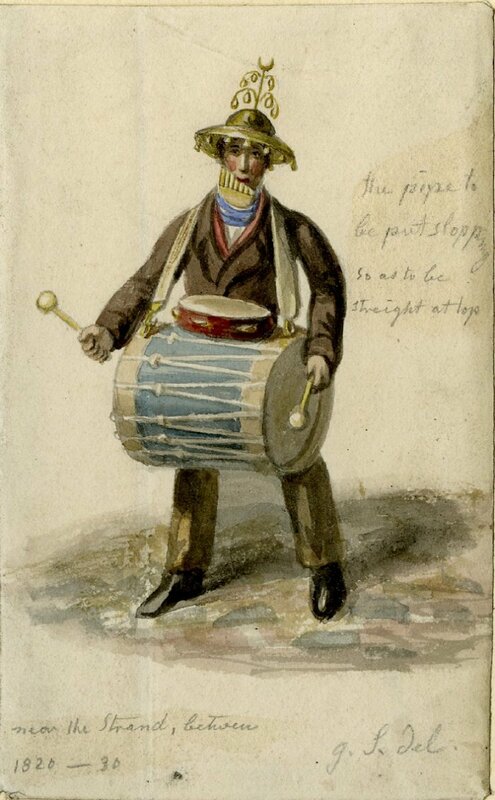 1820-30—England: George Scharf’s one man band includes bass drum, tambourine, pan pipes, and a hat that’s a Jingling Johnny (see below image; public domain) (British Museum). A book illustration, circa 1830, depicts a wandering Chinese musician playing multiple instruments at a time. 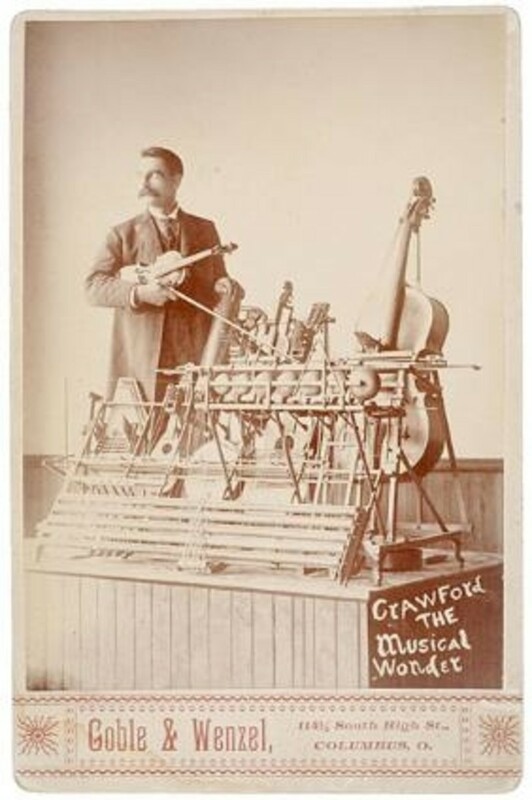 Like some of the earlier examples above, it is not a "self-contained" setup, but instruments are spread out in front of the player on the ground (see below image; public domain). 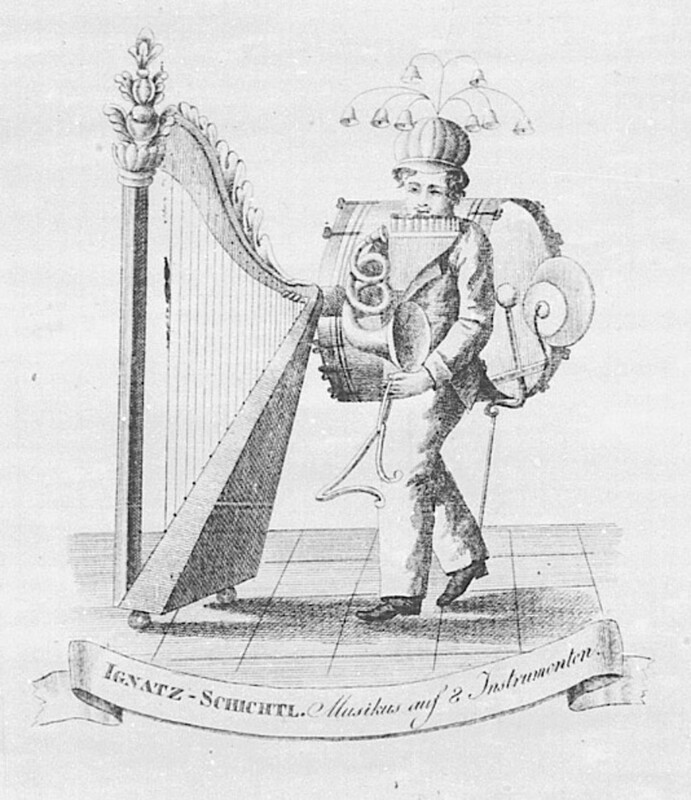 A print by Ignatz Schichtl entitled Musikus auf 8 Instrumenten (c. 1830) depicts a one-man band. The standard elements include bells derived from the Turkish crescent above his head, bass drum on his back, and pan flute. The unusual element is the large harp on wheels (see below image; public domain) (Germanisches Nationalmuseum, Nuremberg). 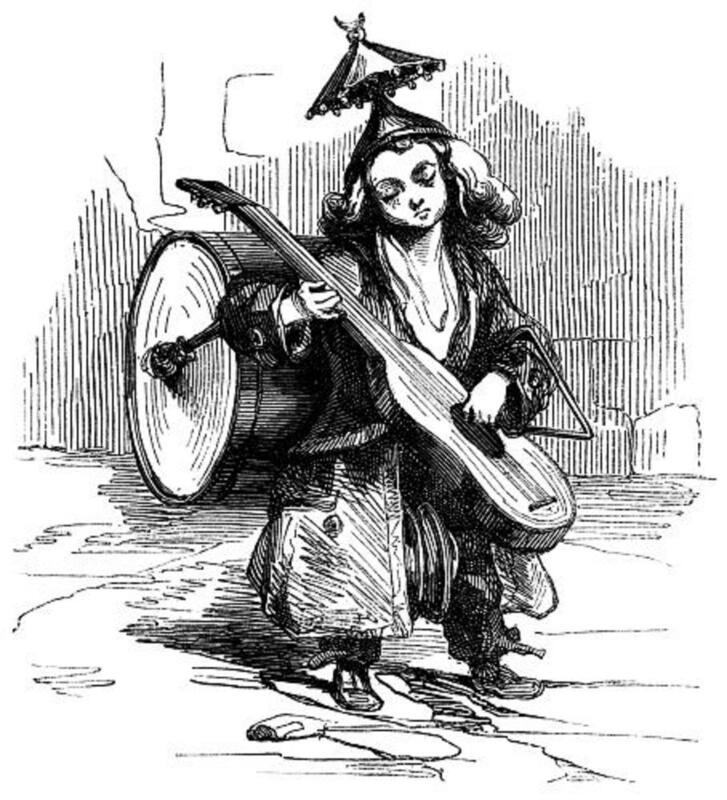 What appears to be a young girl is depicted in Frédéric Goupil's Les Aventures de Jean-Paul Choppart par Louis Desnoyers: L’Episode de Panouille (1843), with bells derived from the Turkish crescent above her head, a bass drum on her back, triangle on her arm, and guitar in her hands (see below image). 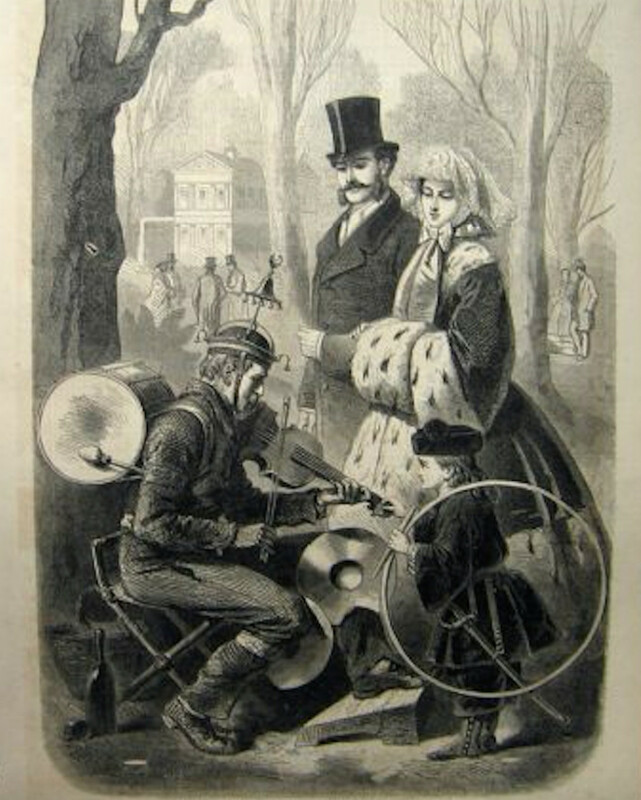 An 1862 print from Le Monde Illustré with the caption “Types Parisiens.—L’homme-Orchestre des Champs-Élyées” features several traditional elements from the one-man band configuration, including bass drum strapped on the back, jingling johnny on the head, and cymbals on the knees. The performer holds a violin (see below image). 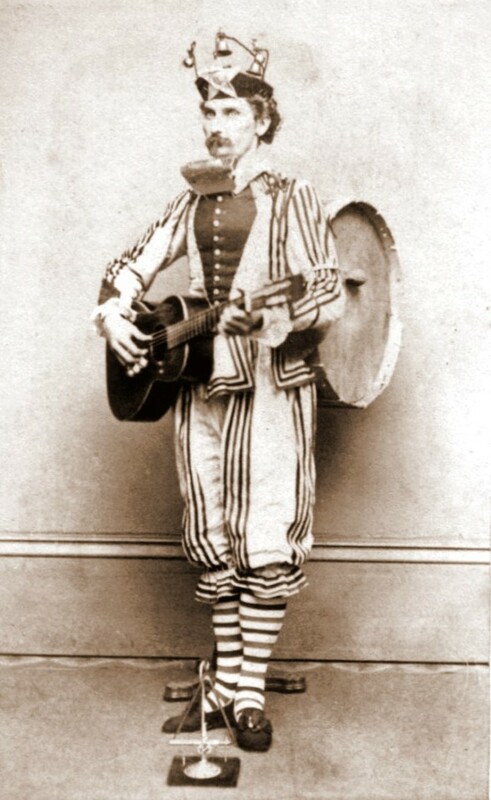 A one man band dressed as a jester is shown below in a photograph from Massachusetts, circa 1865, by O.C. Knox. You can see the common traits of the bass drum strapped to the back, bells on the head, and pipes (or harmonica) below the mouth (see below image). 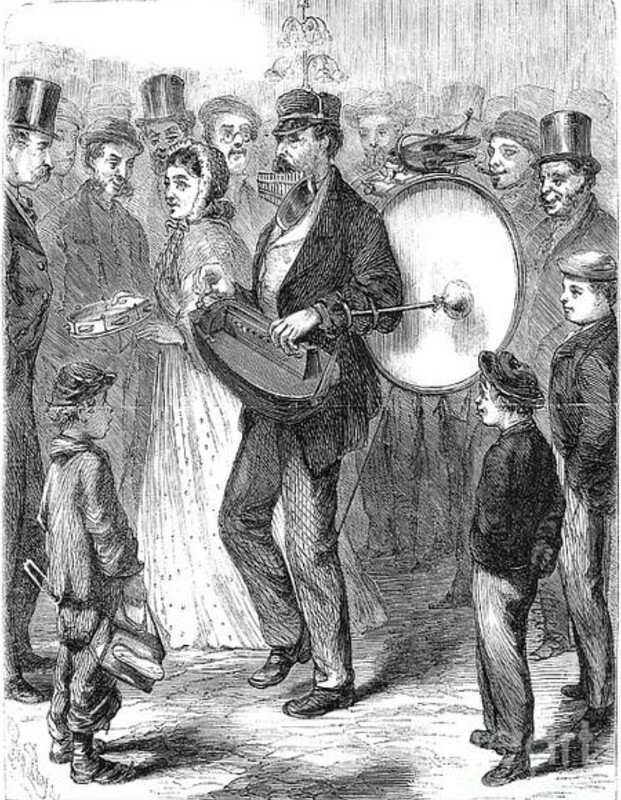 A line engraving from 1867 with the title New York Street Musicians—An Individual Band depicts a Victorian-era one-man band. The man’s setup includes the traditional jingling johnny bells on the head, pipes at the mouth, and bass drum on the back. In addition, he operates a hurdy-gurdy with his hands (see below image). 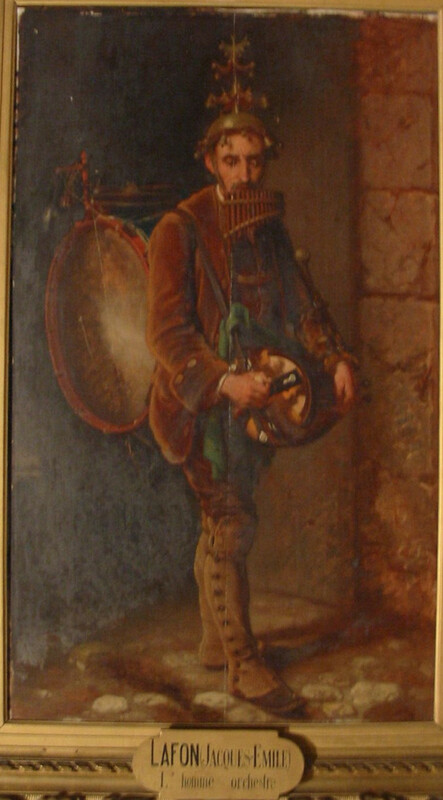 L'homme orchestre, Jacques Emile Lafon's painting of a one man band from 1873, includes many standard elements: pipes at the mouth, jingling johnny bells on the head, and bass drum on the back. It is difficult to tell what instrument he holds in his hands; it may be a hurdy-gurdy or a percussion instrument of some sort (see below image). 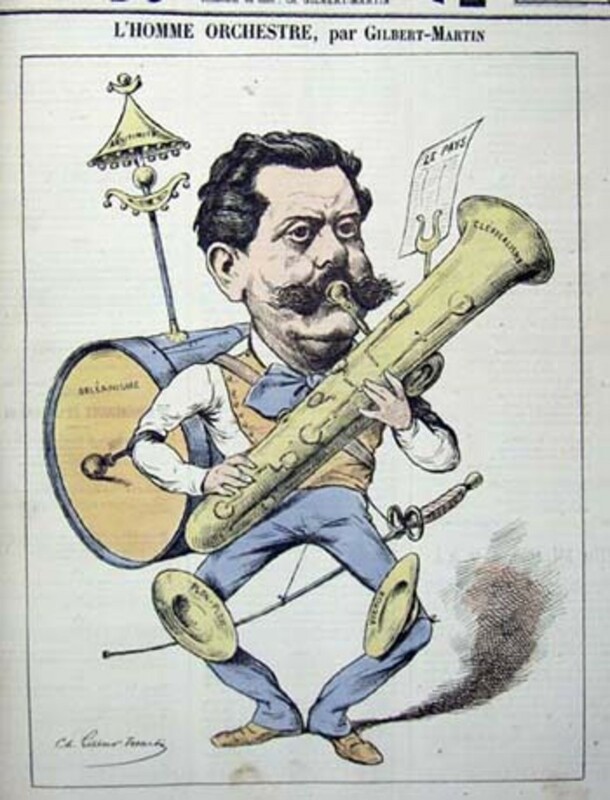 Charles Gilbert-Martin's L'homme Orchestra, a satirical political image published in the Don Quichotte magazine in July 1883, shows another one man band (see below). The performer has the typical bass drum strapped to his back and cymbals strapped to his legs, while the bells, derived from the Turkish crescent, are this time attached to the drum rather than the player's head. The brass instrument he is playing is an ophicleide, a popular low brass instrument of the time considered a predecessor to the tuba. 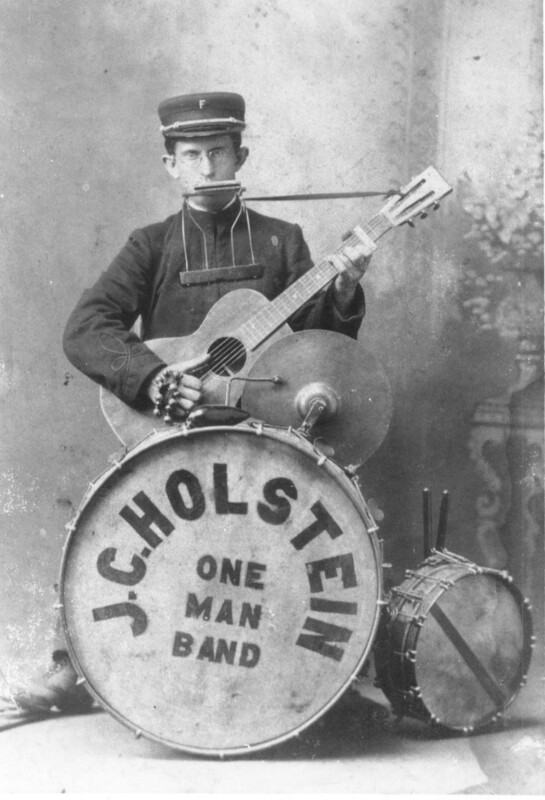 Below, a set of four photographs show one man bands from the late 19th/early 20th century. The first one has pipes below his mouth, a common one man band instrument. The first three wear the janissary bells ("jingling johnny") on their heads, and all four have bass drums strapped to their backs. The first player holds a hurdy-gurdy (a common street musician's instrument) and the other three an accordion. 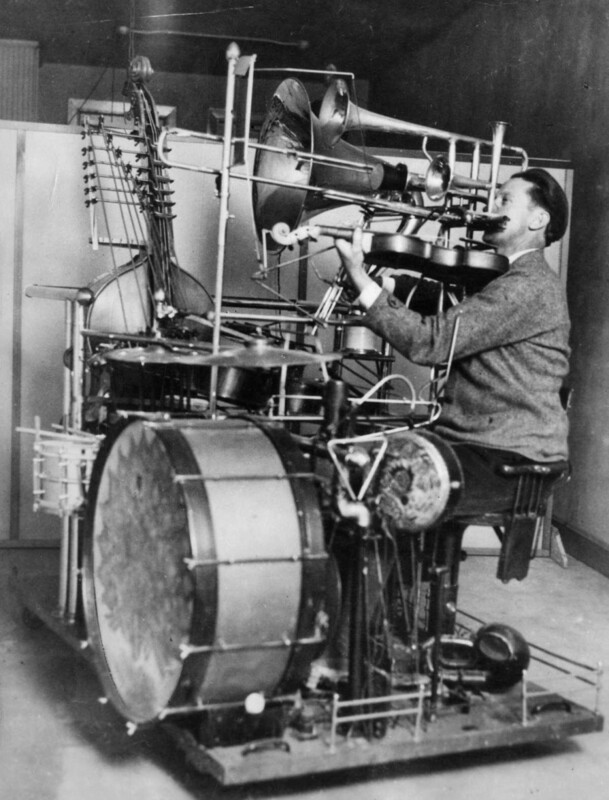 Another mechanical setup from around the same time period shows similarities, but this time with trombone and possibly other brass instruments included (see below). 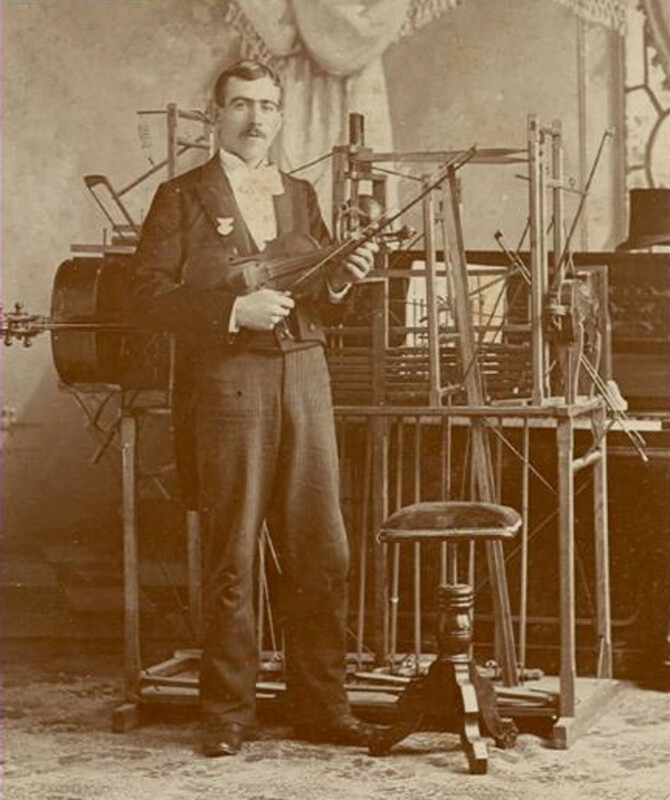 An African American man sits for a photograph in a studio, circa 1900, with what appears to be a non-portable one-man band (see below image; public domain). 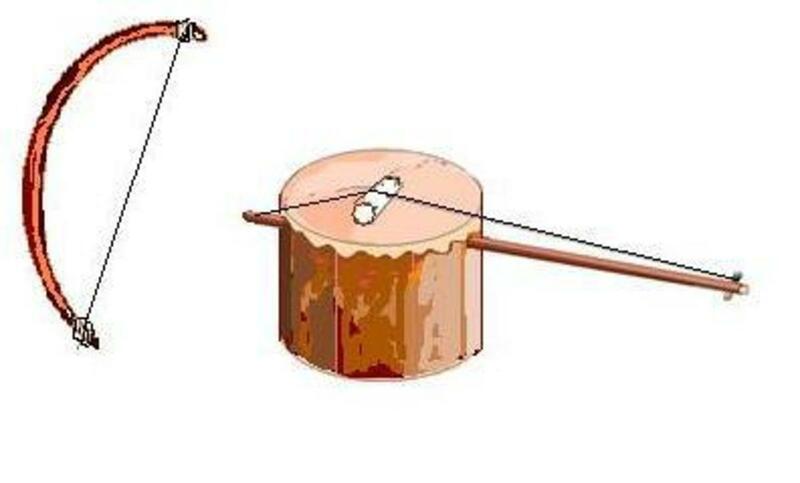 In the early 1900s one J.C. Holstein of Franklin, Indiana utilized a somewhat simplified non-portable setup (see below image; public domain). 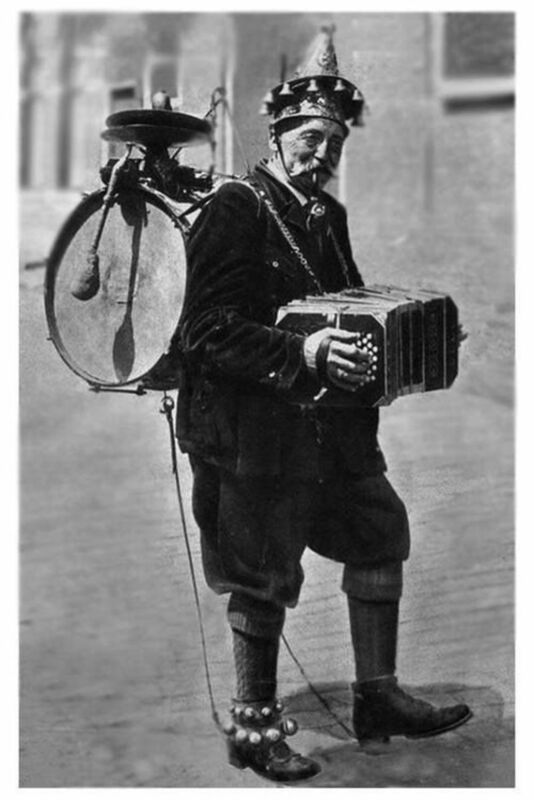 Finally, taking us up to the present, below are several entertaining video clips of modern one man bands from around the world: Croatia, England (featuring some excellent didjeridu playing), US (featuring a very decked-out washboard), and Italy. Enjoy! Not sure if that worked... Here's one from Rope Man. Great stuff! Here's another one from Rope Man. Thanks for your comments, Expand and Training. Those guys do make it look like fun. One of my kids was watching one of the clips and he kept saying, "I want to try that!" I'm thinking this could be a new career path! Thanks for writing this hub. Fascinating. Thanks for the exhaustive research and detail. I enjoyed this! Thanks, David. Happy Thanksgiving to you! Really busy today. I absolutely did not have time to watch all those videos--but I did, anyway. Well done once again. Nice hub. Here's another one man band, using lots of technology, and a chicken suit. Thanks for the fascinating history and photos and videos of one-man bands, kt. Really enjoyed the read.